"PlanetJ's Web Object Wizard (WOW) met our immediate need and addressed our concerns right out of the box." Borders Group, Inc. is a publicly held company with 2009 consolidated sales of $2.8 billion. Borders Group operates Borders.com; over 506 Borders superstores in the U.S.; three stores in Puerto Rico; and approximately 168 stores in the Waldenbooks Specialty Retail segment, including Waldenbooks, Borders Express and Borders airport stores. In addition, virtually all Borders stores feature Seattle's Best Coffee cafés. Borders is finding new ways to help their customers create richer and more satisfying lives through knowledge and entertainment with a rich shopping experience, providing them with the books, music, movies, and other entertainment items. 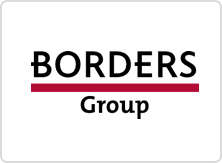 Borders Group, Inc. needed browser-based applications that could be accessed both locally by corporate users and remotely by stores and field sales representatives. These applications also needed to be incorporated with proprietary database information and business processes from multiple servers, blended with elements from third party web sites..
PlanetJ's Web Object Wizard (WOW) met their immediate needs and addressed Borders Group's concerns right out of the box. Traditional coding methods were too limiting in capability, were largely green-screen and lacked the efficiency of graphic presentation. Web developer resources at Borders Group were dedicated to their ecommerce site, and developers that were available did not have much depth of experience (if any) with web development. Their existing in-house tools were unable to seamlessly integrate with the 3rd party web applications. WOW solved all of these problems. Borders Group developers had the skills for working with WOW: SQL, RPGLE for stored procedures, some HTML and CSS training, basic Java programmer training (formal in some cases, others used teach yourself books), and all had the drive to learn new things. As Mark Webb, IT at Borders Group stated, "WOW's tutorials enabled us to establish a development environment based on an Apache Tomcat web server and iSeries database server. We then sent a developer and technical lead through basic training and this enabled us to present a working draft of our first application within just a couple of weeks, including the design time spent with the user. The basic training is well organized, well paced, and did not overwhelm us with training on features we wouldn't use." Their production implementation used an IBM WebSphere web server in order to standardize with their organization's technical support expertise. This, plus placing procedures to their change control process to be SOX compliant, took them about a month (no fault of WOW but information worth noting). After implementing a couple of applications and becoming more proficient using WOW, Borders Group recognized the need to be able to get deeper into WOW's capabilities to meet more complex and customized processing requirements. They proceeded through the WOW Advanced training course. This proved to be well worth their time and was very well suited to their level of experience. They now continue to deliver a broader set of features and functions to their users. Overview: The Assortment by Plan Code application is an inquiry with 2 displays providing summary data for use by merchandisers for managing product assortment via a link to a 3rd party tool. The first thumbnail image (click for a full-sized image) shows the first display screen in which the user would choose a merchandise group from the dropdown, or Possible Values, list. Once a user selects a merchandise group and clicks the "Search" button, the application then shows summary data for the selected group and includes the selection prompt for another group as well as a hyperlink to a 3rd party application (Above the Treeline). Overview: The Store Tools application shows six displays for maintaining store information. From here, the Borders developers can Add a store, maintain store information and administer to the application settings for each particular store. The first display appears after authentication (using Database OS signon) and is the main menu; with 3 large, easy to read buttons. When the "Add Store" button is clicked, this display loads, allowing the developers to insert a new store record, complete with any necessary information and comments. This next display loads when the "Maintain Store" button is clicked. The Maintain Store list loads 350 entries at a time in a scrollable list with previous/next option (in case more records than 350 are returned), and buttons that help sort based on store type and reloads the list. From the above display, there are links to the Store Info maintenance display and Store Status Scheduler display. Both of these links are activated by clicking on them in the table and will contain info based on the particular row the developer selected the link on. The Store Info maintenance display is used by Borders to maintain current information about their stores. The Store Status Scheduler is used by Borders to maintain the status of a particular store. The final display can be accessed by clicking the "Application Options" button. 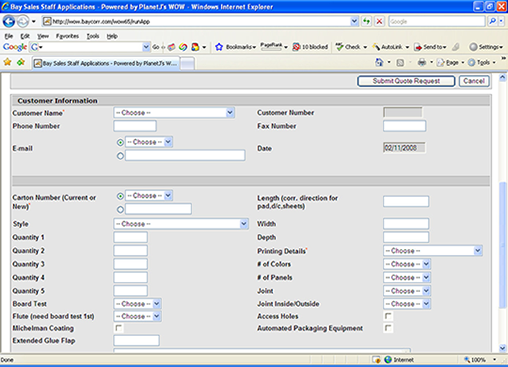 The Application Options displays a scrollable list with next/previous option, store type selection buttons, and buttons to set the option to enabled or disabled for all stores in the list. 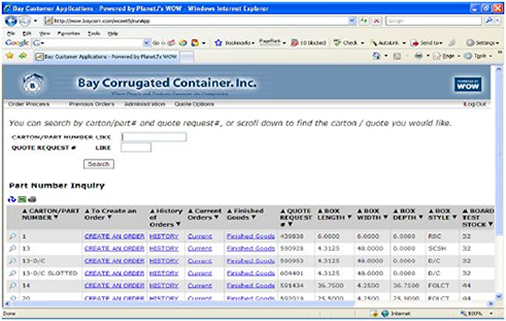 Application: DART Overview: DC Assortment Replenishment Tool, or DART, allows buyers to replenish DC (distribution centers) quantities, and update an items replenishment control settings via a link on item number or name. The first display is pre-set with filter options based on the users operating system log-in ID that also produces a list of items based on the filter with replenishment info. 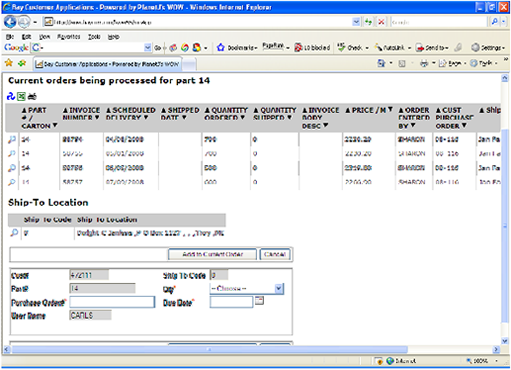 A daily batch process generates orders from the items and quantity data set here. The second display is shown when the buyer clicks on an Item number or name and allows for detailed information and item specific replenishment control settings. Borders Group, Inc. used PlanetJ's WOW product to build numerous applications right out of the box. While leveraging PlanetJ's support, they started projects small, built their skills and are now using WOW as the base for many in-house applications. Customer satisfaction – our users are pleased with results that in-turn save them time and effort. The browser based solutions that WOW enables provide a significant leap forward in information presentation and decision making that is a huge advantage over green screen – data entry and displayed results that would span multiple green screens and often gets rather cryptic can be done legibly and intuitively all at once. Developer satisfaction – having WOW as a web application development tool simplifies that effort while allowing us more time to focus on database design and processing accuracy, resulting in an overall better quality business process. We realized a 70% to 80% saving in effort in the web application portion of development projects."